Anyone who has followed this blog knows, flooring has easily been the most discussed adventure in my home ownership odyssey. 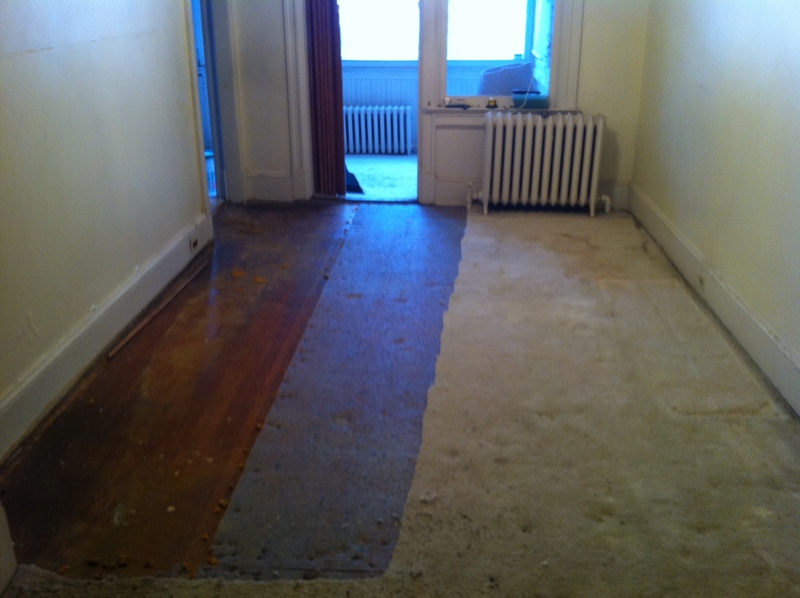 With only one more carpeted section of the house, this may actually be the second to the last flooring post! The sun room was carpeted, and as to be expected, was disgustingly stained and well damaged from the sun and foot traffic. I used it as the dumping ground for random construction materials and a staging area for most of the house projects. As such, it was basically the last room on the main floor that was given any attention. Part of me just wanted to do some spot sanding, then lacquer the floor to preserve the articles. 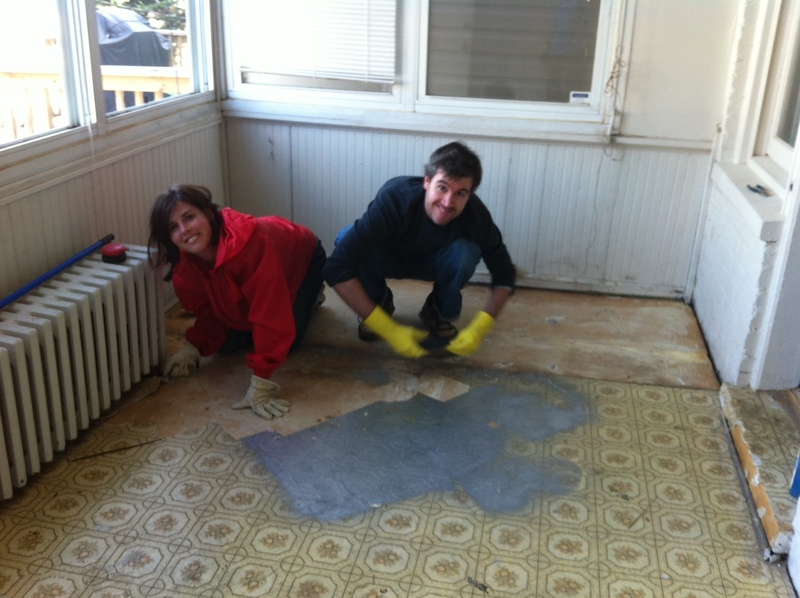 With some wonderful old ads and a few bizarre local stories, I thought it a pretty awesome time capsule of life in Washington, D.C. Well, “sense” prevailed, and we decided to just cover it in pergo laminate flooring. Given my druthers, I’ll eventually take this out and refinish the original flooring. And still plan to preserve at least some of the newspaper clippings. 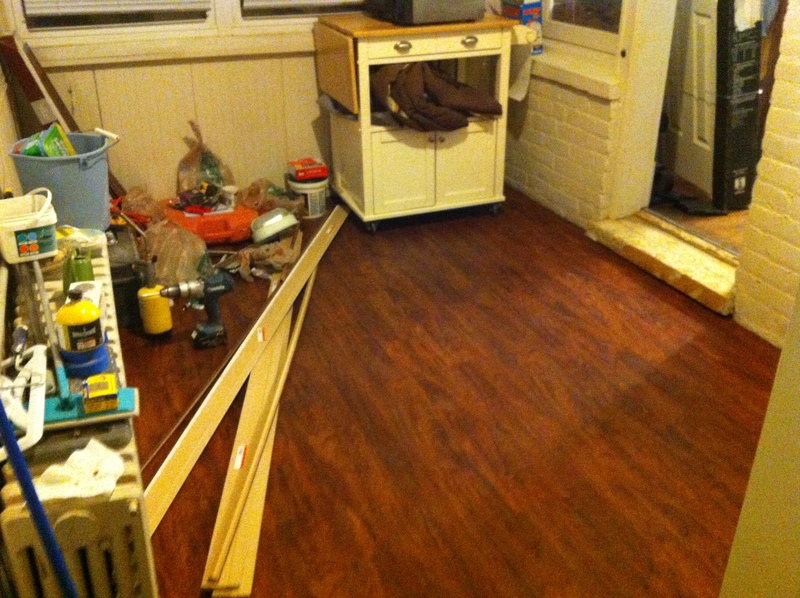 But until then, pergo flooring just made a lot more sense given the traffic this room will see. The main floor of this house has a sunroom extension that we have dubbed, “the solarium.” It’s 105 square feet of windows facing my backyard, right on the other side of the kitchen and dining room. My vision is to install benches that would allow for a breakfast space as well as additional storage that my kitchen severely lacks. I bought a generic white kitchen cart/butcher block with two stools that will be extra work space for cooking, and I expect that it will also serve as the table where most of my casual meals will be eaten. So only thing left to sort out is the flooring. 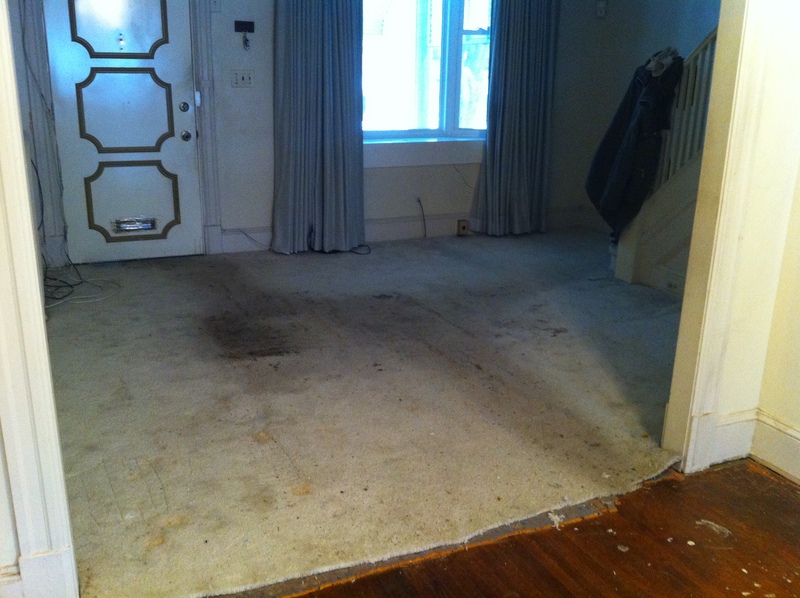 It is the second to the last room with the nasty carpet left over from the previous owners. 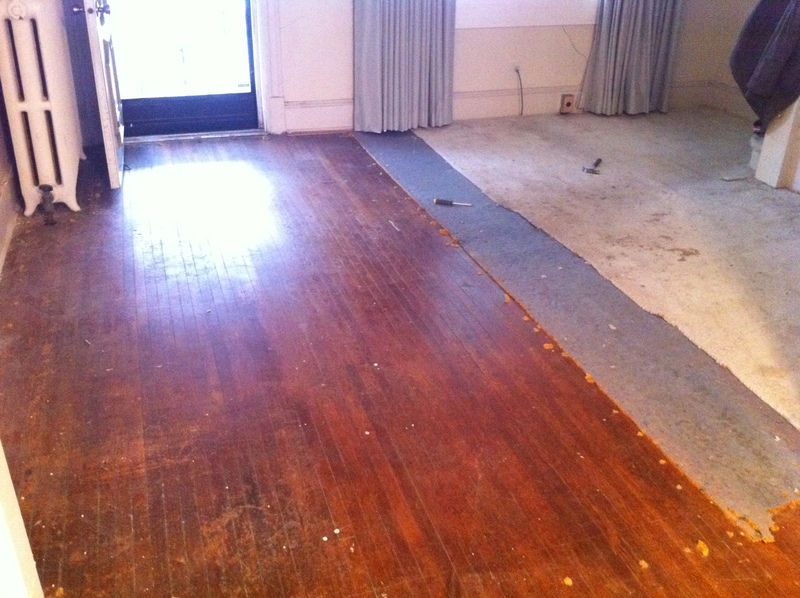 We easily disposed of the carpet, padding, tack and staples. Literally, it probably only took us half an hour. 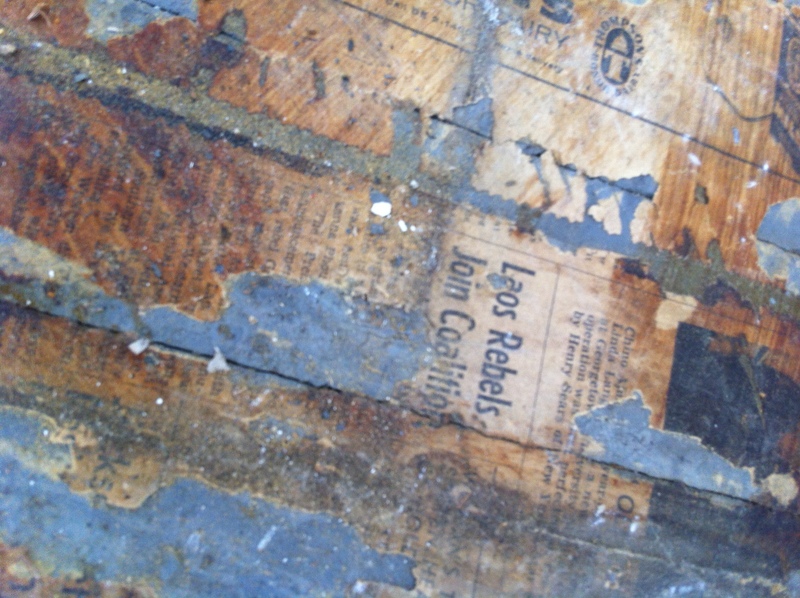 But what we found underneath was a little disheartening – 1950s sheet vinyl. Which would have been fine, except at some point someone tried to paint a patch of it silver. Which actually looked pretty interesting – the paint didn’t cover the tile design entirely, so it almost looked like tin. But for whatever reason, someone clearly stopped in the middle of that project. In addition to this, the vinyl had tears and was worn down to the plywood at certain points. So my only option was to remove the vinyl. Which was a long, arduous and painful process. Two hours or so later, we discover, under the vinyl by the door, there was some black mold. So at the very least, this patch plywood would need to be replaced. After abating the mold with bleach water, I let it sit overnight with the plan of removing the one patch of plywood and just throwing another layer of laminate on top of the existing plywood for a new floor. Well – SURPRISE! 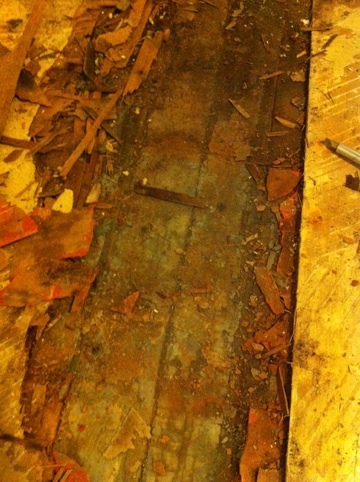 Under the plywood was another layer of pink laminate tile. And under that? 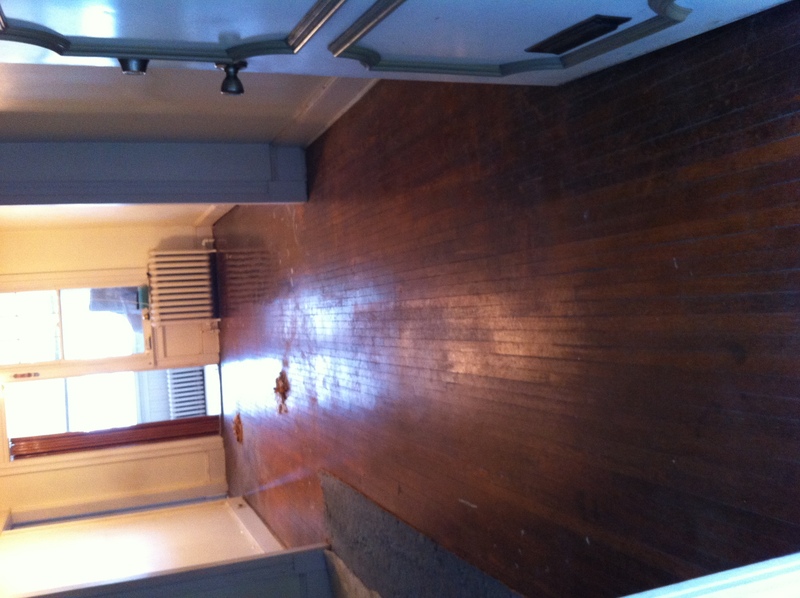 THE ORIGINAL HARDWOOD FLOORS! 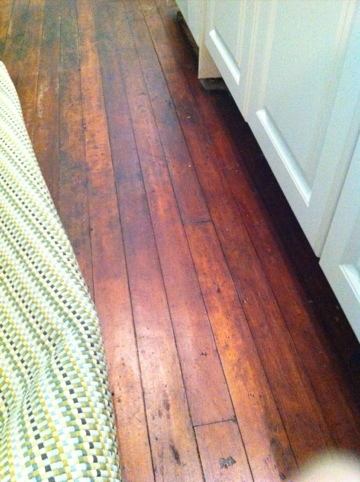 I’m convinced this is the original hardwood from 1920 because it’s the same wood as can be found in the kitchen and upstairs bedrooms – pine. And the size of the boards are the same as well. 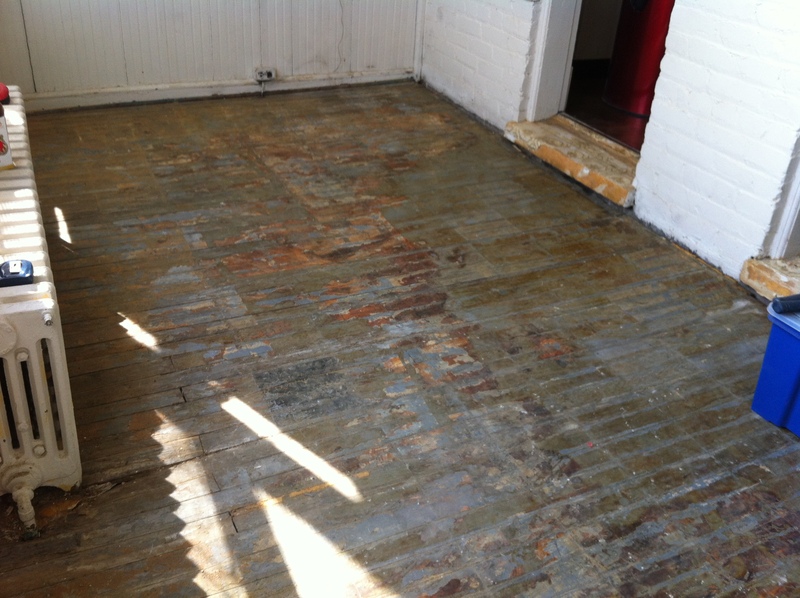 Here is a shot of the floors in the kitchen. I need to pull all the plywood up to check the condition of the hardwood throughout the 105 square feet, but if it’s anything like the kitchen, I’m going to want to refinish it. 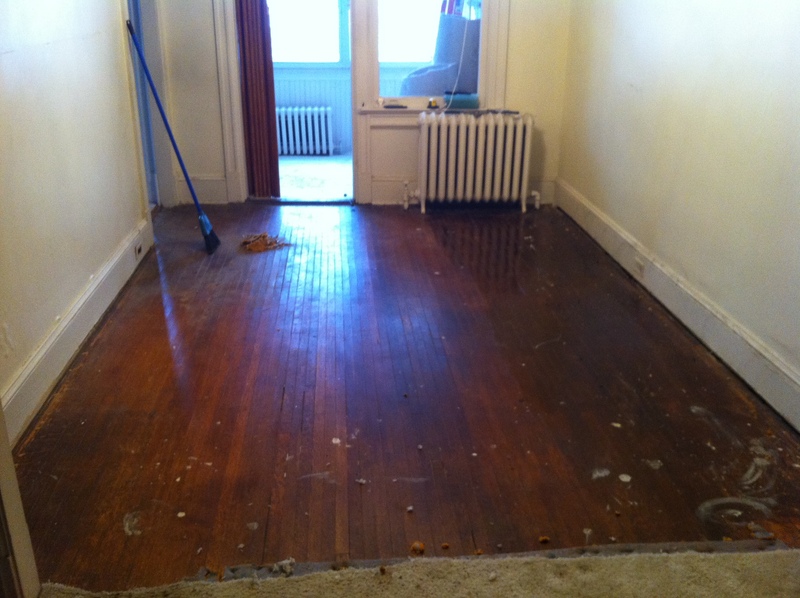 Needless to say, I’m pretty excited to find that I have the option to expose all the old hardwood. I’ll need to stain and poly the floors once the plywood is removed, but that’s a small price to pay to have hardwood flooring all throughout the main floor of the house! And while a “solarium” would probably be better served with laminate flooring, I’m happy to be getting back to the original look of the house. I can’t wait to rip out the rest of the carpet! Such a simple task, but such a dramatic effect. And satisfying. It was like I was finally getting to know my house. And it me, if that makes any sense. Proper cleaning, sanding, refinishing will happen once all the other work is done (kitchen/plumbing/electrical upgrade), but this is the first thing that I, ME, MYSELF have done to the house. And I’m very pleased. That’ll do pig. That’ll do.